Grew up with Sloboda Dita Tuzla (Bosnia-Herzegovina) juniors. Moved to Slovenia for the 2002-03 season, signed by BC Olimpija Ljubljana 2nd Team. Signed for the 2003-04 season by KK Triglav Kranj. Moved to Belgium for the 2004-05 season, signed by Huy Basket. Moved to Italy for the 2005-06 season, signed by Virtus Bologna. Back to Slovenia for the 2006-07 season, signed by KD Slovan Ljubljana. Signed for the 2007-08 season by BC Olimpija Ljubljana. Moved to Lithuania for the 2009-10 season, signed by BC Zalgiris Kaunas. In February'11 moved to Spain, signed by Real Madrid CF. Moved to Greece for the 2013-14 season, signed by Olympiacos Piraues. Moved to Slovenia for the 2014-15 season, signed by BC Olimpija Ljubljana. In November'14 moved to Spain, signed by Baskonia Vitoria. Signed for the 2015-16 season, signed by New Orleans Pelicans. In December'15 moved to Spain, signed by Bilbao Basket for the 2015-16 season. 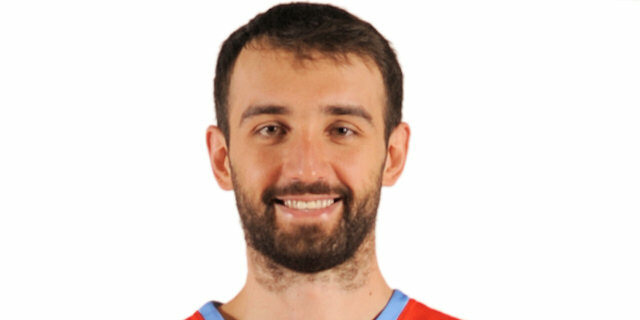 .moved to Croatia for the 2016-17 season, signed by Cedevita Zagreb. Won the 2013 Intercontinental Cup with Olympiacos Piraeus. Led the 2010-11 EuroLeague in blocks (1.5 bpg). Won the 2007-08 and 2008-09 Slovenian National Championship with BC Olimpija Ljubljana. Won the 2012-13 Spanish National Championship with Real Madrid CF. Won the 2008 and 2009 Slovenian National Cup with BC Olimpija Ljubljana. Won the 2012 Spanish National Cup (King's Cup) with Real Madrid CF. Won the 2010 Baltic League with BC Zalgiris Kaunas. Played the 2007 and 2009 Slovenian All Star Game. Played the 2010 Lithuanian All Star Game. Played at the 2005 European U-20 Championship. Played at the 2011 and 2013 European Caampionships.